Here’s a bold statement, but one worth making; silver is trading at rock-bottom prices. Don’t be surprised if silver prices make a solid run to the upside in 2018 and resume the long-term uptrend. One of the biggest reasons to remain bullish on silver prices is India. You see, the country known for its gold consumption is building up a huge appetite for silver. Over the past few years, gold buyers have come under a lot of scrutiny in India. Also, the yellow precious metal could be getting a little expensive for the average consumer in the country. An ounce of gold costs 85,000 rupees. Mind you, this doesn’t mean there isn’t demand for gold in the country. But, as this is happening, silver in the country is being liked a lot. This is very evident with the silver import figures. If you do simple math, this represents an increase of close to 106% year-over-year. In this same period, when silver demand increased 106%, gold imports in the country jumped 71.5%. Here’s the thing; silver imports into India over 2017 were nothing but stellar. We saw triple-digit growth in silver imports in several months. Obviously, you never heard about this in the mainstream media because it was busy talking about how key stock indices are soaring and how you should stay away from precious metals. 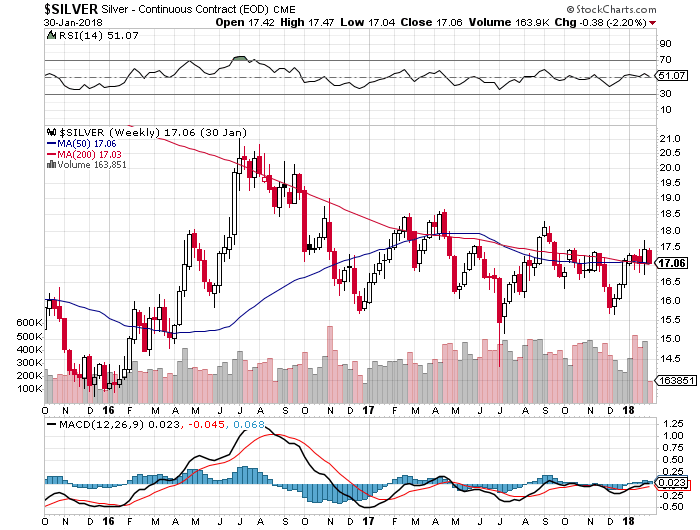 How Far Could Silver Prices Go in 2018? Dear reader, it’s a very common phenomenon; investors, at times, tend to ignore fundamentals and start paying attention to the noise. As I see it, fundamentals of the silver market are severely ignored these days, and it makes sense why. Why would someone look at an asset that increased about five percent in the last quarter, when stocks have soared close to 10%? In the meantime, conditions are getting ripe for much higher silver prices. Once investors start to realize how low silver is trading relative to its fundamentals, they could be rushing to buy the metal. And, when this happens, you could be seeing silver prices moving higher at a much faster pace. I am talking 10%+ days. With this said, look at the chart below. As it stands, silver prices are fighting a downtrend that began in mid-2016. But, if you notice, there’s a lot of support around $16.00 level. The price hasn’t broken below this level. It has been tested three times. Furthermore, look at the moving average convergence/divergence (MACD) momentum indicator plotted at the bottom of the chart. It’s starting to trend higher as price has been relatively flat. This says buyers are starting to come in. From experience, I know that whenever something like this happens, we see a move to the upside. Could it be the case with silver prices this time around? It’s possible. For 2018, if silver prices close above $21.00, we could see “fireworks” in the silver market. I won’t be shocked if that level is reached this year.